The 2012 version has the same Bar Code and ISBN as this version. 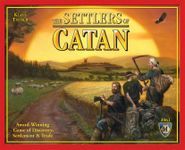 The fourth edition of Catan and its related expansion was originally published with tiles of a particular thickness. When they decided to publish the Explorers & Pirates Expansion, they felt they needed thicker tiles due to the constant tile flipping. So they started printing the base game and all the expansions (with the exception of C&K) with thicker tiles to match in 2012. -- My source is a phone call with the publisher. I have two copies, one of each thickness. This is the 2007 version. It has the thinner tiles. It does not have a QR code on the side of the box.